The relationship with food can be a complicated one, for both adults and children alike. Essentially, we need nutrients from food to help fuel our bodies and energize our intentions. For children, it helps them to develop and grow – and it is important that kids make healthy food choices at an early age. These healthy decisions will surely be carried with them through to adulthood. Food bring friends and family together, and that’s exactly the case at Summer Camp. Educating your camp staff can really drive the idea of helping children make these good decisions. However, every child looks at food in a different way, and that is why there are a few different techniques that will help you to set the example. 1) Setting the Example. It is important that us adults set the tone for a positive relationship with food. This is good because if you don’t eat healthy, well, maybe you should, in order to set a good example. Veggies, healthy proteins, fresh fruit and a variety of whole grains. If they see you eating it, they will be far more likely to try it, and might just leave camp with a few new, healthy eating habits. Even explaining to children, the importance of veggies and protein, might help them to understand the WHY. 2) Avoid using dessert/foods they like as a “reward”. 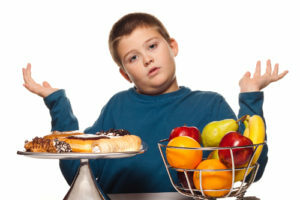 When kids reject vegetables for example, it might seem like a sure bet, however, is does not help their relationship with food at all. In fact, it works in the opposite. This will display to them that the dessert is something that they should pursue. The last thing you want to do is have to give your kids dessert every meal! 3) Hungry vs. Full. Everyone knows the clean plate strategy. This is simply useless. As kids embark on the journey of developing their relationship with food, they must be at liberty to learn when they are hungry and when they are full. This clean plate strategy can often have negative effects on the child developing a positive relationship with food. Let them understand their bodies. They know when they are hungry or full. More ways that you can help kids have a healthy relationship with food. Camp staff can really have a positive effect on campers, from developing interpersonal skills to creativity and the imagination, healthy eating habits should be among the top on the list. Making staff aware of the importance of how kids approach their plate can resonate for the rest of their lives. Creating a positive mealtime environment in the dining hall, open lines of communication with campers and counselors can drastically affect the developing of healthy eating habits and a positive relationship with food. We are sure that camp parents would really appreciate the help!